Mark A. Chappell and Theresa L. Bucher 2006: Effects of temperature and altitude on ventilation and gas exchange in chukars (Alectoris chukar). International Journal of Poultry Science, 5(5): 428–431. Turgay Oengul et al. 2006: A Study on Determining Protein Level in Diet of Partridge (Alectoris chukar) During Growing Period (0-4 Wk). Diversity and Distributions, (Diversity Distrib.) 12: 714–724. Marina Barilani 1994: Hybridisation with introduced chukars (Alectoris chukar) threatens the gene pool integrity of native rock (A. graeca) and red-legged (A. rufa) partridge populations. The Auk 111(2): 416–426. Gray J.E. 1830: Illustrations of Indian Zoology: Chiefly Selected from the Collection of Major-General Hardwicke, 1, Treutel, Wurtz, Treuttel, Jun. & Richter London. Robinson A.C.; Larsen R.T.; Flinders J.T. ;Mitchell D.L. 2009: Chukar Seasonal Survival and Probable Causes of Mortality, Journal of Wildlife Management, 73(1): 89–97. 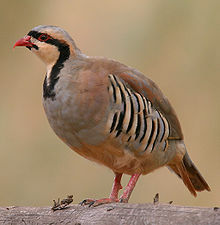 For more multimedia, look at Alectoris chukar on Wikimedia Commons. This page was last edited on 15 January 2019, at 12:09.